Here’s a set of photos from yesterday when Mara was born. 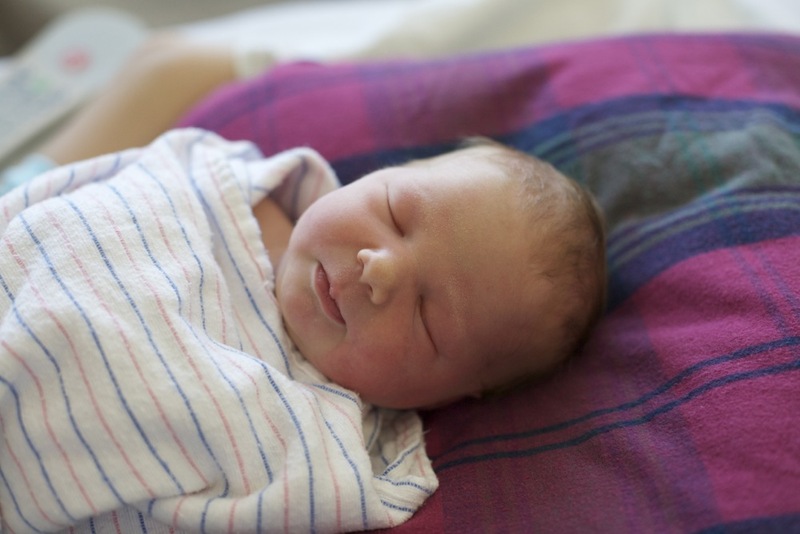 Here’s a set of photos from today, shortly before we left the hospital for home. Born April 25th, 2012 (on her actual due date) at 1:06 a.m., weighing in at 7 lbs. 9.5 oz. and measured at exactly 20-inches. All the girls in the family are doing great and are excited to start on this new adventure in life! You turned 6-years-old today. I haven’t written to you in this form in four years. I feel compelled to write to you now because for me, your birthday just seemed a little anticlimactic in the 6-year-old birthday sense. Maybe that’s because your past birthdays have always warranted a big fuss and to-do. You seemed to enjoy your birthday today, and you told me as much during our palaver tonight before you fell asleep. Besides indulging in whatever it was that you wanted to do today, the only thing I wanted to do was take some nice photos of you this morning. I wanted a set of nice “Maly’s 6th Birthday” photos. You obliged and agreed to walk to the mailboxes with me where we could take photos of you near the new limestone wall that was recently built. As always, you were a perfect little model. You’ve learned over the years that mom and dad are invariably always behind a camera and part of your job as our brood is to allow us to take photos of you. I probably shot over 100 frames with you as the subject this morning. I knew that there were at least 5 shots in there that were going to be perfect for your 6-year-old portrait. I’ve learned over the years to be respectful of your time. I’ve learned that if I’m going to take your portrait, I’ll make it fast because I know you’ve got butterflies to chase and songs to sing. Our portrait session was quick, and we were soon back at the house. You ran off to the backyard to do something, and I went to my computer to download the 100 photos and find the few that were perfect. It was then that I learned that I didn’t put a CF card in the camera before we left for our photo shoot. Not a single photo was captured. At first I was mad at myself, and I wanted to fetch you from the backyard and take you for an immediate photo shoot do over. But I missed my only opportunity. With little persuasion, you probably would’ve done the photo shoot again, but there was nothing compelling me to persuade you. It was at that point that I knew it was okay that we didn’t get any photos from the photo shoot. And it wasn’t really until tonight, after you’ve been long since asleep, that maybe I wasn’t supposed to capture any photos. I was supposed to watch and laugh with you as you posed with the stuffed lion monkey that your mom and I got you for your birthday. I was supposed to acknowledge you when reminded yourself that your mom had told you to keep your shoes on so you wouldn’t get your feet dirty or get a sticker stuck in one of them. I was supposed to remember our conversation about how we both love the smell of the jasmine flowers that line the sidewalk on our path to the mailbox. I was supposed to remember the butterfly that you delicately caught with your bare hands and the excitement in your eyes and smile after you’d done so. I was supposed to remember the six years to date that you and I have walked to the mailbox and have talked about everything under the sun. And I do remember all of those things. I remember them well. Those are the fleeting moments that were meant for me, not for film or digital images. You had a good 6th birthday. I think I’m just a bit sad because you continue to grow up, and part of me wants you to stay as my little daughter forever. And maybe it’s because I’ve realized that this will be your last birthday as my only child. You’re wise beyond your years and you don’t even know it. You continue to baffle and amaze me. Maybe it wasn’t the “perfect” birthday for you in my mind, but it was a perfect birthday to you. And to me, it was a perfect day because you were there to remind me that it was. The thing on the left costs between $99-$249. 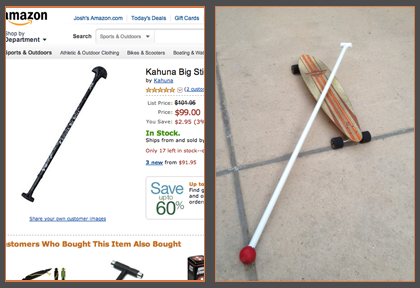 The thing on the right costs $4.99 for PVC pipe, a T-joint and a Kong ball. 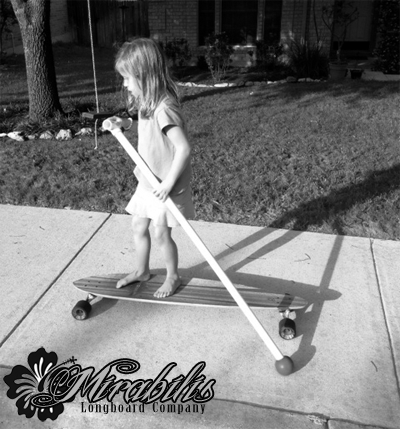 It’s that time of year when the mirablis jalapa are blooming and I feel like longboarding. This year I’m going to be land paddling to exponentially improve my current non-existant upper body strength. And it looks like I already have a riding partner.